Complete and submit the online university application. 2. Indiana State University application fee: $65.00 (U.S.) non-refundable. The application fee is payable by Visa, MasterCard, or check or international money order made payable to Indiana State University. Submit the application fee to the Office of Admissions, Indiana State University. Please note the application fee is non-refundable. 3. Official transcripts and credential evaluation. The credential evaluation process can take several weeks to complete, and we strongly urge you to begin the process as early as possible. Your application will not be complete until we have received all of your academic credentials. Upload full and complete official academic records from every secondary and post-secondary non-U.S. institution you have attended. 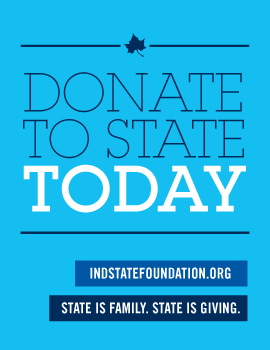 If you attended high school, college, or university in the U.S., you must have the official transcript(s) sent directly from the school(s) to the Office of Admissions at Indiana State University. You will be required to submit a final official transcript or school-certified copy from your non-U.S. high school, college, or university. Please complete and send the academic records request form to your previous institution. If your school/institution does not provide official academic records in English, your native language academic records must be translated into English by an official translation agency. We do accept credential evaluation reports from these select members of the National Association of Credential Evaluation Services (NACES). 5. Original current bank statement must be mailed directly from issuing bank to Indiana State University. 7. Copy of passport. If studying in the United States a copy of your current I-94 card, F-1 or J-1 visa, and I-20 or DS2019 are also required. If currently in the United States but not studying, a copy of the applicable visa must also be submitted. For affidavit of financial support and copy of passport, you can submit the electronic copy in the "supplemental materials" tab in the online admission application. NOTE: All academic and supplemental documents that are submitted to Indiana State University become property of Indiana State University and will not be released.